Thingness (2017) was created for the performative exhibition, ‘The New Flesh’, curated by Tasman Richardson, held at The Music Gallery (Toronto). Using invisible forces to transmit a signal through a circuit of transformative devices, everyday objects that emit light, heat, produce air currents and transmit radio waves, playfully delineated a path of causality. 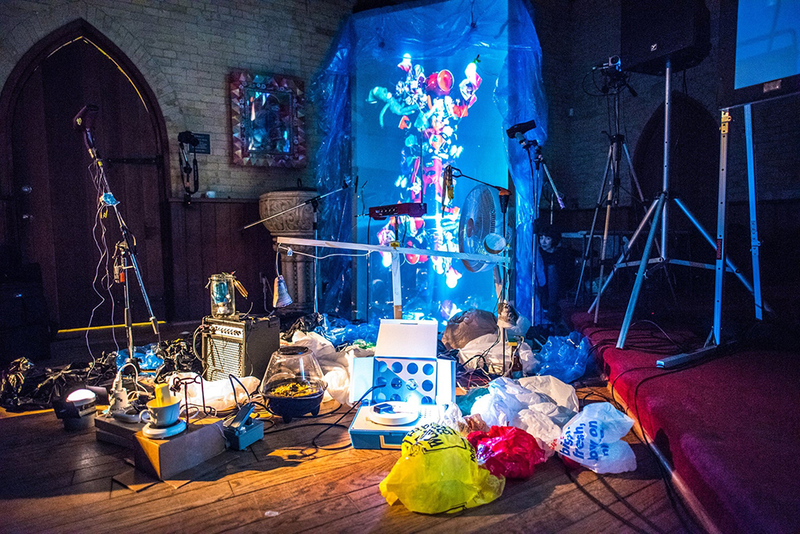 Often using what was available in the room in a bricolage process that oscillated between absurdity and ingenuity, this assembled circuit drew upon invisible, virtual and intangible forces to move physical objects in a rhythmic composition. Triggered by a video signal, objects such as fans, flashlights, and hotplates, functioned as generative transmitters to receptors constructed of simple domestic electronics, such as light and motion detecting devices, translating the signal to another format, producing yet another signal in the relay. Projected video creates sound with photocell resister and 555 chip --> Audio signal sent out --> triggers relay --> turns blow dryer on --> tips mercury switch --> motor w/light turns --> light sensor --> relay --> turns hot plate on --> butter melts ---> micro switch --> turns on fan to play a theremin with a banana + hot plate ---> turns on second hot plate --> melts chocolate --> micro switch to relay --> turns on popcorn maker....Our video creature made from rubbish touched the physical realm creating heat, driving motors, spinning fans, flickering lights, playing instruments, inflating and moving more rubbish. Sometimes it makes popcorn for us.